Hi. It’s been a while. My camera lens shattered–hence the weird blur thing I’ve got going on in the pictures, I’ve been a busy busy girl, etc. Anyways: IT’S FAAAALL, EVERYONE. I absolutely adore fall. I am such a southern California baby; any sort of weather change makes me SO EXCITED. Especially when it involves beautifully colored leaves! And big comfy sweaters! And boots, and tights, and thick socks, and tea, and apples, and crisp autumn air, and scarves, and pumpkin flavored things. I repeat. Pumpkin flavored things. What’s not to love? Come October, I search the city of New York high and low for the best pumpkin themed treats and products (FYI New Yorkers: Stand Burger on E 12th and University has FABULOUS pumpkin milkshakes, and the pumpkin scone that I’ve tried so far is definitely at Alice’s Tea Cup) and I’d say I’ve done a pretty good job with my findings. Now that I actually look at a list it does seem rather excessive…whatever. Sue me. I’m just a girl who loves pumpkin more than anything, that’s all. You’ll note that this picture was taken towards the end of the life of this batch of pumpkin bars…they go fast. 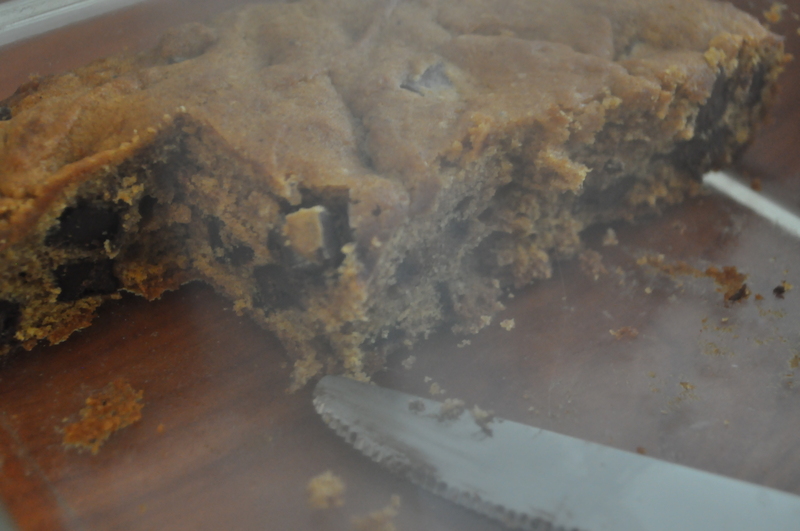 I made this yesterday, so the fact that a 9×13″ pan of them are already in this state is saying something. Apologies for the terrible quality of the photo, the camera lens issue plus the state of the pumpkin bars when I actually got around to photographing them was not idea, but oh well. These pumpkin bars are my absolute favorite pumpkin dessert to make for my family when I go home in the fall/winter. They are much appreciated by my dad and brother especially. I really, strongly believe that you will love them just as much! Preheat the oven to 350. Grease a 9×13″ pan and set it aside. In a small bowl, mix together the dry ingredients (flour, spices, baking soda, and salt) and set this aside. In a large bowl, cream together the butter and sugar until fully combined, then add in the egg and vanilla it all together. Next, add the pumpkin puree to your butter and sugar mixture and mix well. This will look a little curdled and funky; you didn’t do anything wrong! It’ll all come together in the next step: gradually mix in the dry ingredients to the large bowl a little bit at a time, stirring constantly. Once completely combined, dump that entire bag of chocolate into the batter, mix, and pour into your prepared pan. Bake for 30-35 minutes (mine took the full 35, plus even a couple extra for the middle to set) until a toothpick inserted in the center comes out clean. Voila! There ya go. Prepare for these to be eaten very quickly; they’re pretty wonderful. 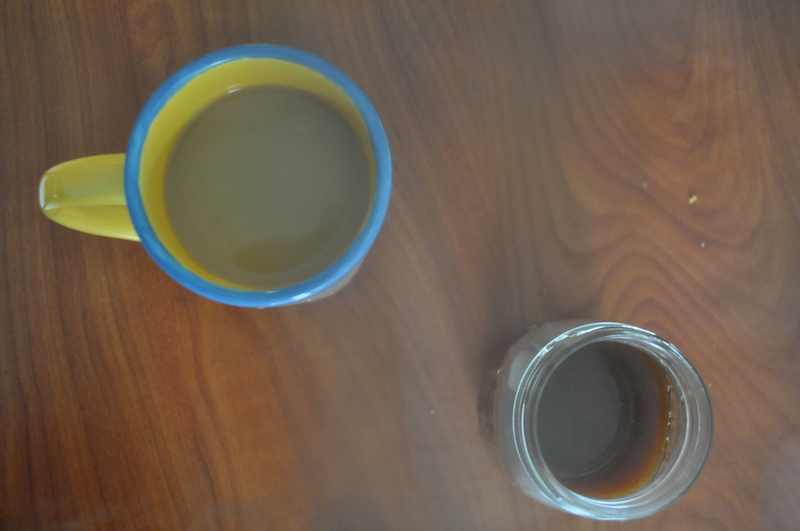 See that mason jar of gritty-looking, thick, brown liquid? Yep, that’s what you’re making! I understand it looks highly questionable, but let me tell you. It is delicious. I adapted this recipe from this one for a pumpkin spice latte, but since I do not have an espresso machine (I wish), I just pour it in my coffee and it does the trick just the same! It’s my own version of the obscenely expensive–but equally addicting–Starbucks pumpkin spice latte. It certainly does the trick! Combine all of the ingredients in a medium saucepan over medium-low heat, stirring every once in a while. Do so for about 10-15 minutes; it should thicken a little but it will do most of the thickening once you take it off the stove. Once it has cooled enough, you can strain it if you’d like to get rid of some of the gritty situation caused by the spices that will inevitably settle to the bottom, but you don’t have to! I don’t mind the spices, nor do I have a strainer or cheesecloth on hand, so I just stuck it in a mason jar in the fridge and called it a day. Mkay guys, all you have to do is mix this all together. Maybe add some dried cranberries or whatever else you like (I did that plus some walnuts, it was delicious). Also no picture for this one. Apologies. This was DELICIOUS. I am absolutely in love with my banana smoothies, so this pumpkin version nearly killed me. In a good way. Death by pumpkin deliciousness. For all of you who do not understand what the “big deal is” with all this pumpkin stuff: shame on you. Pumpkin is magical and wonderful in every way. It is the epitome of FALL FLAVOR. I will definitely be making more pumpkin things soon (pumpkin snickerdoodles have been on my radar recently, along with my eventual pumpkin apple crumb pie eventually for my Thanksgiving masterpiece), so pumpkin fans, stay tuned. It’s going to be a great fall for food. Categories: Breakfast, Dessert, Drink | Tags: bars, breakfast, chocolate chip, coffee, dessert, oatmeal, pumpkin, pumpkin spice, smoothie, syrup | Permalink.